A few weeks ago I participated in Rebecca’s bake sale to raise money for Making Strides Against Breast Cancer. I donated 2 jars of customizable granola for the sale. – Oil: I can make it like the original recipe with coconut oil OR I can use canola oil if you are not a fan of coconut. – Sweetener: Let me know if you like sweet granola or semi-sweet. 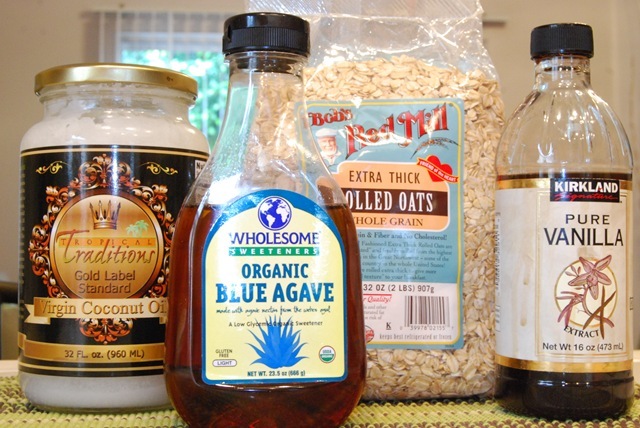 I can put additional amount of agave or maple syrup on your granola. – Dried Fruits: I used unsweetened coconut flakes on the original recipe. But you can also substitute coconuts if you don’t like them. 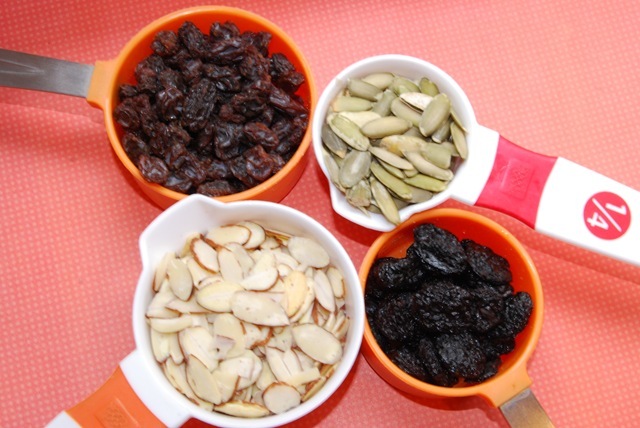 Pick from (raisins or dried apricots or dried dark cherries or dried blueberries). 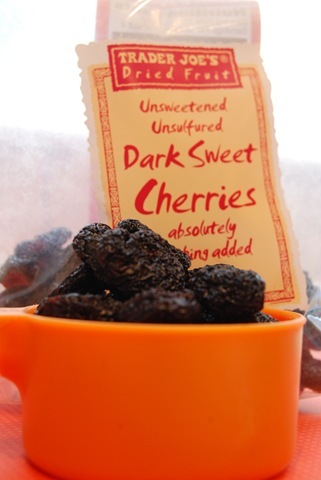 Dried Fruits: Raisins & dried dark cherries sounds really good! Preheat oven to 300 degrees. Put agave and coconut oil on very low heat until thin. 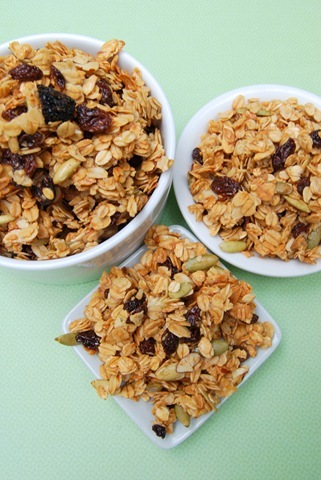 Stir in almonds, pumpkin seeds, raisins, dried cherries and vanilla. Mix until they are coated well. Add oats to the mixture and mix well. Transfer the mixture on a greased non-stick cookie sheet. Spread them evenly. Bake for 10 minutes and then stir mixture. Bake for another 10 minutes or so. Watch it carefully. The mixture will turn brown quickly. 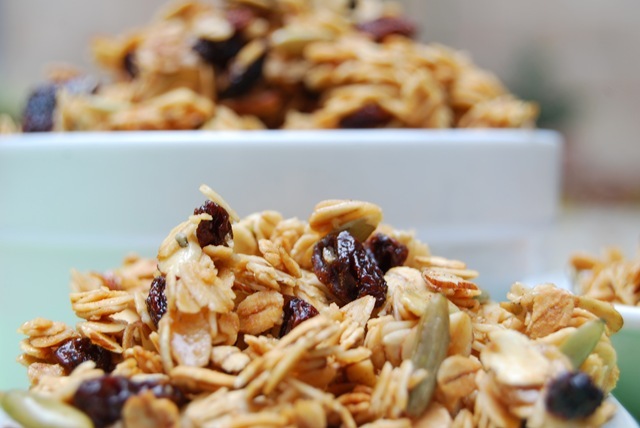 Remove from the oven and let granola cool completely on the sheet before storing it in a tight sealed container. I love using cherries when baking chocolate chip cookies, now I know it’s great with granola too. 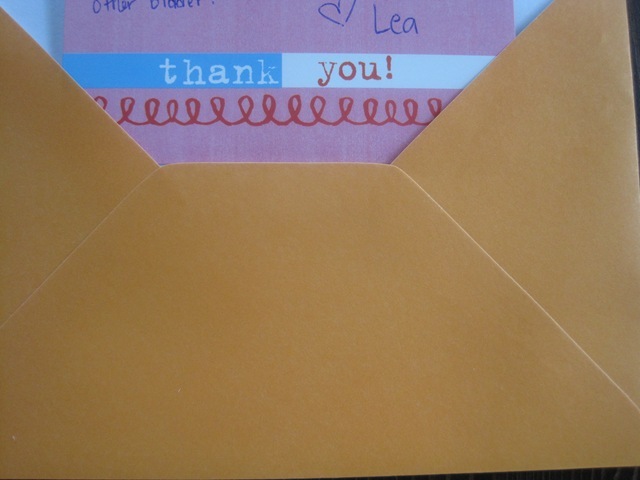 A thank you note from me and off the granolas go!! 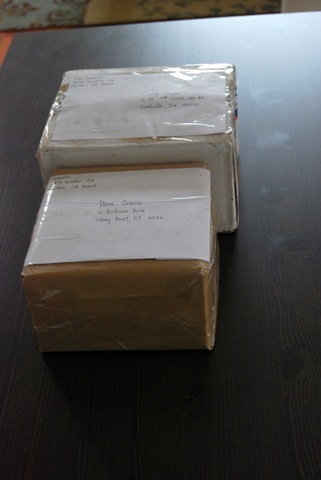 I received the granola last night! 🙂 I opened it up to take a sniff (since I had already had dinner and shouldn’t eat anymore) and it smelled so good, I dove right in! Had to stop myself from eating it all. I Love granola. 🙂 It is sweet but not to sugary (that’s a good thing!) and the raisins and cherries are such a good contrast to the almonds and pumpkin seeds. I can taste the coconut oil without it being overpowering. I brought both bags to work to share and I’ll be passing on some samples and your blog links to fellow bloggers over here! Thanks again for putting you granola into the sale, and I am a very happy customer. 🙂 ! 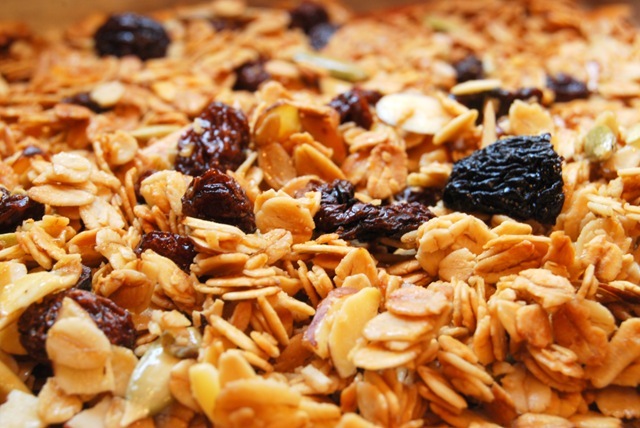 If someone offered to bake you granola, what ingredients would you request in your granola mix? Mmm… this looks SO good. Thanks spabettie 🙂 It felt great baking for a good cause. I’ll let you know next time I know of any bake sale in the blog world. 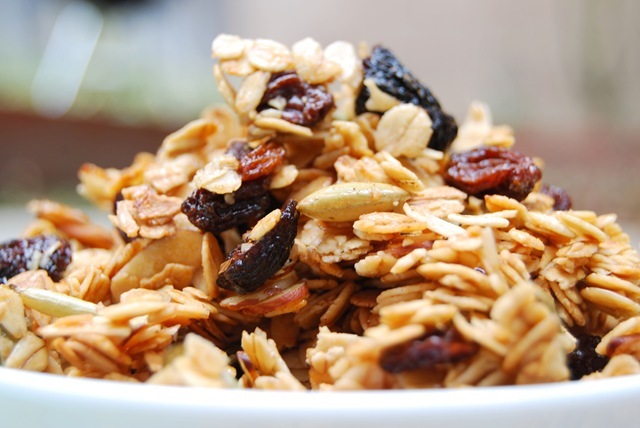 ooh this granola sounds so tasty! what lucky ladies! i think i’d want dried apricots and (unsweetened) dried cranberries, maybe some almonds or walnuts, and some vanilla-esque or cinnamon overtones. I like your granola combo, I think I’ve had apricots and cranberries in a snack bar before and it was good. I love the aroma of the house when I bake with vanilla. Rock on wit yo bad self girl! That’s a GREAT compliment 🙂 And it looks beyond delish! Hmm, I think I’d want almond slivers, raisins/craisins, and some sort of cinn punch! Thanks Shanna…I was so proud that I rocked it! PS – I did take Maya to the Dora show at the Nokia. And your niece is absolutely right, the girl playing Dora looked nothing like the cartoon. That was the first thing I said to my husband! So simple 🙂 I like 2 ingredient recipes. Oh good thing we didn’t take her to the show. I’m thinking of dressing up as Dora for her for Halloween. Wow! That looks so good!! Def worth making!!! Looks sooo good! I love it just the way it is that’s a great combo. Yumm I even have the ingredients. Woo Hoo. Hi Lesley, thanks for visiting my blog 🙂 I look forward to getting to know you and your blog. Love the groovy hair on your About Me page, love it! wow they look freaking good!! I would be SO happy if someone offered to bake me granola 😀 I’d be happy with cherries! I’m loving your new avatar picture, love the bangs! I usually wear bangs in the Fall and I’m due for the cut soon. 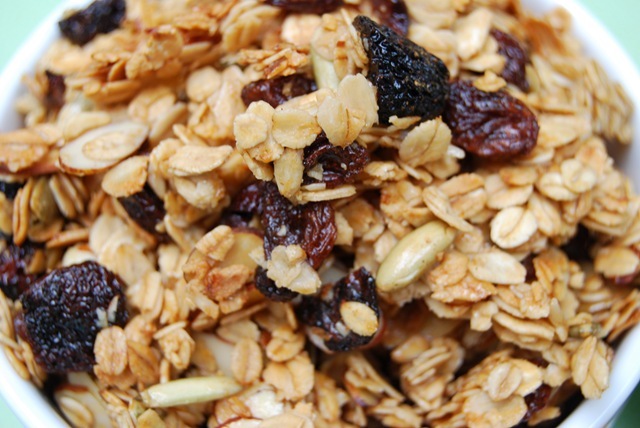 This is the first time I had cherries in granola, definitely will be using cherries in my baking soon.